Manyimportant decisions,ranging from locating an oil prospect or a land-fill site to determining the location and sizeof an earthquake-producingfault,are based on geo- logical maps. Because a map-scale structure is never completely sampled in three dimensions, geological maps and the cross sections derived from maps are always interpretations. The interpretation may be complicated by direct struct… ural observati- ons,likebedding attitudes,that are misleading because they represent a local structu- re,not the map-scale structure. Some data may simply be wrong. The interpretation of the geometry of even a single horizon, therefore,alwaysinvolvesinferences about the validity and meaning of the observations themselves as wellas the nature of the geo- metry between the observation points. How is an accurate interpretation to be con- structed and how is it to be validated once complete? 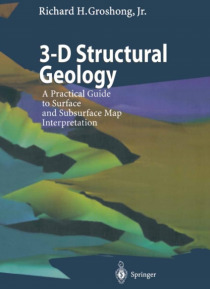 The objective of this book is to demonstrate the concepts and techniques required to obtain the most complete and accurate interpretation of the geometry ofstructures at the map scale. The methods are designedprimarilyforinterpretations based on out- crop measurements and subsurface information of the type derived from welllogs and two-dimensional seismic reflection profiles. These forms of information all present a similar interpretive problem, which is to define the geometry from isolated and dis- continuous observations. The underlying philosophy of interpretation is that structu- res are three-dimensional solid bodies and that data from throughout the bodyshould be integrated into an internally consistent interpretation.